It wasn't exactly "shock-and-awe," but stocks churned out another record close on Wednesday thanks to strong results from companies like Apple and Delta. 1. How high can they go? 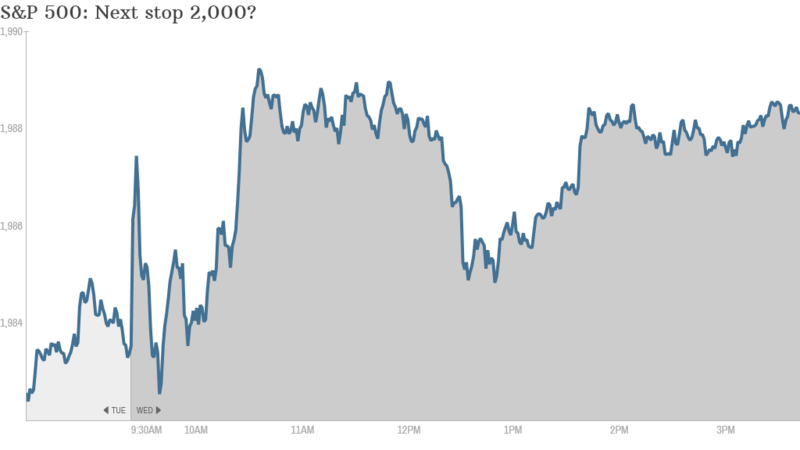 The bulls on Wall Street wasted little time, nudging the S&P 500 to a fresh intraday record right out of the gate. The broad index celebrated its 26th record close of the year, landing at 1,987. That tops the previous record set on July 3. Powered by healthy tech earnings, the Nasdaq advanced 0.4%. But the Dow Jones Industrial Average failed to join the party, ending down 0.16% after struggling all day to keep its head above water. Despite the dip, the Dow is just about 50 points away from its all-time record close. 2. Geopolitical jitters ease: Major indexes across Europe inched higher after EU officials stopped short of imposing tough economic sanctions against Russia. "I think some of the macro geopolitical concerns have, at least for the moment, moved back to the back burner," said Art Hogan, chief market strategist for Wunderlich Securities, referring to violent conflicts in Israel and Ukraine. Still, the relief could be short-lived as Europe demanded Russia's "full and immediate" cooperation over Ukraine or risk losing access to European finance, defense equipment and energy technology. Also, Ukraine said a pair of its fighter jets were shot down in rebel held territory on Wednesday. Germany's Dax gained 0.2%, while Russia's Micex index slipped 0.3%, taking its losses for the year to nearly 7%. 3. Big-name earnings excitement: Wall Street continues to applaud healthy report cards from Corporate America. Not only are the vast majority of companies beating earnings expectations, an impressive chunk are also exceeding revenue forecasts. That's a positive sign for the economy and stock prices. Shares of Apple (AAPL) jumped almost 3% after the world's largest company reported a quarterly jump in sales and profits. 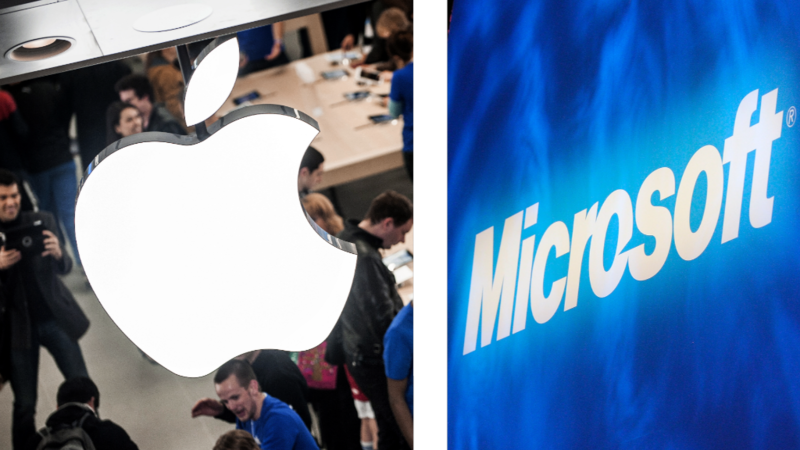 Investors largely overlooked a more cautious outlook for the current quarter, as well as slowing iPad sales. Apple closed less than 4% away from its split-adjusted record high of nearly $101 set in September 2012. PepsiCo (PEP)also rallied nearly 3% after the food-and-beverage behemoth beat the Street and boosted its outlook for the year. The latest strong numbers from Delta Air Lines (DAL) kept the airline's stock flying high. Delta closed about 4% in the green. Related: Nothing can ground Delta. Earnings fly higher! On the other hand, Boeing (BA) shares declined 2% after the jet maker reported a lower-than-expected revenue increase. Still, Boeing reported earnings that beat expectations and upped its outlook for the year. Tupperware Brands (TUP) melted about 10.5% in response shrinking earnings and dimmed profit projections. In after-hours action, AT&T (T) slipped over 1% after reporting earnings that missed expectations by a penny. After flying almost 3% higher during regular trading, Facebook (FB) retreated after-hours despite posting earnings that blew away expectations. 4. Tech stock movers -- Intuitive Surgical, Biogen: Intuitive Surgical (ISRG) raced nearly 18% higher a day after the robotic surgery company posted profits and revenue that topped estimates, despite coming in lower than a year ago. Biogen Idec (BIIB) provided a boost to the much-maligned biotech sector. Shares surged 11% after the drugmaker logged earnings and revenue that trounced expectations. On the flip side, shares of Juniper Networks (JNPR) tumbled close to 10% after the networking-equipment company forecast soft earnings and revenue for the third quarter. It's also been an ugly day for chip maker Xilinx (XLNX). The company's shares plummeted 14.5% on disappointing revenue and a gloomy outlook for the current quarter.